Bridging the information gap has emerged as an integral part of the development process. It talks about engagement where all the participants are key members in the development process and not mere spectators. Increasingly the need for two-way communication process to understand community needs and package relevant knowledge for community empowerment has become very important. Bridging information gap is about designing and implementing communication-based strategies to influence change in a desired direction and for that there is need to understand the socio-economic and cultural practices of the communities. It is also important to look at triggers than can influence behaviour change. Bridging information gap is used in various programmes to scale up development initiatives that have proved to be successful. Communication mediums vary from digital medium to traditional mediums of communication such as community radio, films, power point presentations, street plays, community melas, wall paintings etc. Various issues are addressed and awareness is being created with the help of such mediums. The Indian economy recorded a fairly high GDP growth rate of 7.2% during 1998-2008. However, this high rate of GDP growth did not translate into inclusive livelihood opportunities for the rural poor. In reality, it adversely impacted the rural poor due to various structural changes in the last ten years. The share of primary sector in the GDP declined from 26% to 17.5% between 1998 and 2008, even as the share of rural population, which was dependent on this sector remained the same. This has adversely impacted the livelihood of 98 million small and marginal farm households. It is important to ensure that those who remain in agriculture are made efficient and competitive. It is equally important to promote occupational mobility of the rural poor, which is dependent on agriculture and allied activities to attain more gainful off-farm enterprises or employment. Linking communities with information and knowledge about the possible diverse economic opportunities is critical in improving their access to viable sustainable livelihood options that could be achieved with Bridging Information Gap (BIG). Development Alternatives (DA) has been working for more than 30 years in rural Bundelkhand, one of the poorest and most backward regions in the country. DA has designed and implemented communication strategies on various issues to bring about development changes in the communities and bridge the knowledge gap. The organisation uses both ‘communication for results’ and ‘communication of results’ as part of its strategy. Bridging Information Gap (BIG) is used as a tool to communicate issues and concerns of the society besides addressing possible solutions for the same. In order to reach a larger group, BIG module is designed to impart knowledge on topics such as Employability, Entrepreneurship, Apprenticeship, Gender Empowerment, Nutrition, WASH and various government schemes. The module is designed in a community friendly manner. It ensures continuous engagement with the target group. Monitoring and evaluation mechanisms are designed to analyse pre and post intervention knowledge level of the target group. The economy of the economically backward Bundelkhand region in Central India predominantly relies on agriculture and the community is poorly linked to other sources and options for sustainable livelihoods. This increases their vulnerability and ability to break out of persistent poverty. Linking communities with information and knowledge about the possible diverse economic opportunities is critical in improving their access to viable sustainable livelihood options. Community Based Organisations (CBOs) engaged in rural development interventions in the region can play an important role in increasing the access of communities to information, knowledge resources, support services and skills on a range of livelihood opportunities available in the region. The livelihood resource agencies from the private sector, civil society and public sector are also using different communication methods to reach the rural audience. The Livelihood campaign was led in association with six CBOs of Bundelkhand region. The aim was to build appropriate content on livelihood options for the region, disseminate this content using a variety of communication methods and also link communities with local institutions that provide knowledge, skill building, credit support and technical support for new livelihood opportunities. A baseline survey was conducted with 3000 respondents in five districts of Bundelkhand to identify the livelihood opportunities and needs. Grassroots communication modes such as community radio, street plays and local fairs were identified as the optimum outreach methods. Audio modules were developed on livelihood and entrepreneurship opportunities and on support services such as skill building, government training schemes and bank credit facilities. Training workshops were organised to build capacities of CBOs to collect and package information on livelihoods and support services. Interactions with livelihood experts from the Development Alternatives Group helped in developing the content and identifying the ‘communication hook’ for each module that would be developed to bridge the information gap on livelihood issue. These communication modules have been disseminated in the five districts of Madhya Pradesh and Uttar Pradesh reaching a population of approximately 1,200,000 individuals. They have further been used for direct discussion through narrow casting followed by FGD sessions between the community and experts. The CBOs were also assisted to reach out to youth groups in NRLM job and livelihood fairs. Vandana Tiwari, age 30 years, is a resident of Binwara village of Tikamgadh District in Madhya Pradesh. Majority of the community in her village is dependent on agriculture. Due to scarcity of other livelihood alternatives, the entire village economy is facing crisis. Vandana Tiwari and her family were passing through a lot of financial burden and for long she was thinking of taking a lead in not only sustaining her family, but also encouraging other women come out of the jaws of poverty. She thought of bringing other women of the village together and start a Self Help Group (SHG) and engage into savings-credit activity. She met all the women and after a lot of persuasion and perseverance, started a Self Help Group ‘Mariyaditsakh Sahakari Samiti’ with 12 women members. She became the President of the SHG. The SHG members started thinking of getting into entrepreneurial activities. During that time, they came across the Employment Fair, being organised by Radio Bundelkhand. The Employment Fair gave them the opportunity to learn about the Government of India’s Livelihood Mission. 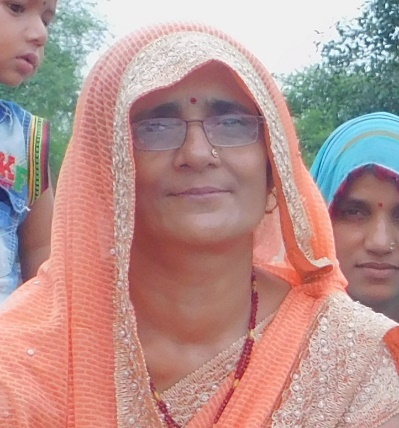 Vandana could foresee the benefits of linking their SHG to the scheme and did so immediately. Through the scheme, the members were provided vocational training on manufacturing of products like soap, toilet cleaner, incense sticks, handbrush, phenyl and sanitary napkins. After gaining training and guidance, the group decided to manufacture the products and sell them to increase the turnover of the SHG. They bought the raw material from the group’s savings. The group soon realised that the product sale is not increasing due to dearth of proper marketing. So, they publicised the products through Radio Bundelkhand and local newspapers. Now, the demand for their products has increased and their financial status has improved. They are able to lead a life of much better quality than before, in terms of good food, good education and a healthy lifestyle.